Human natural IFN-producing cells (IPC) circulate in the blood and cluster in chronically inflamed lymph nodes around high endothelial venules (HEV). Although L-selectin, CXCR4, and CCR7 are recognized as critical IPC homing mediators, the role of CXCR3 is unclear, since IPC do not respond to CXCR3 ligands in vitro. In this study, we show that migration of murine and human IPC to CXCR3 ligands in vitro requires engagement of CXCR4 by CXCL12. We also demonstrate that CXCL12 is present in human HEV in vivo. Moreover, after interaction with pathogenic stimuli, murine and human IPC secrete high levels of inflammatory chemokines. Thus, IPC migration into inflamed lymph nodes may be initially mediated by L-selectin, CXCL12, and CXCR3 ligands. Upon pathogen encounter, IPC positioning within the lymph node may be further directed by CCR7 and IPC secretion of inflammatory chemokines may attract other IPC, promoting cluster formation in lymph nodes. Natural IFN-producing cells (IPC)3 are a small population of leukocytes with a plasma cell-like morphology that are specialized in the secretion of type I IFN (i.e., IFN-α, IFN-β, and IFN-ω) in response to certain viruses (1, 2, 3, 4). Human IPC have been found in the blood and in lymph nodes affected by inflammation, clustered around high endothelial venules (HEV) (4). This anatomical localization has suggested that IPC migrate from the blood to inflamed lymph nodes through HEV. Consistent with this hypothesis, human blood IPC express L-selectin and CXCR3, the receptor for the inflammatory chemokines CXCL9 (monokine induced by IFN-γ), CXCL10 (IFN-γ-inducible protein 10), and CXCL11 (IFN-γ-inducible T cell α chemoattractant) (4). However, it has been shown that human IPC do not migrate in vitro in response to CXCR3 ligands (5). Similarly, IPC do not respond in vitro to CCL3 (macrophage-inflammatory protein 1 (MIP-1α)), CCL4 (MIP-1β), and CCL5 (RANTES) despite the expression of CCR5 (5). Human IPC also express CXCR4 and respond to the CXCR4 ligand CXCL12 in vitro (5, 6). Importantly, CXCL12 secreted by some tumors attracts IPC and protects them from IL-10-induced apoptosis in vivo (6). 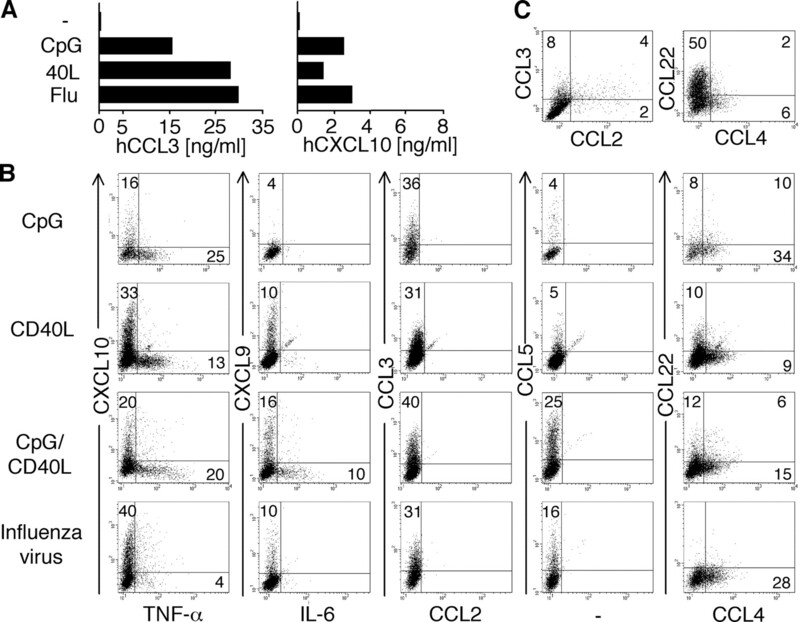 Upon activation with pathogenic stimuli, IPC up-regulate CCR7 and migrate in response to the CCR7 ligands CCL19 (EBV-induced molecule 1 ligand chemokine/MIP-3β) and CCL21 (secondary lymphoid tissue chemokine) (5, 7, 8). Murine IPC have been recently identified (9, 10, 11, 12) and found to be significantly reduced in number in the spleen of L-selectin-deficient mice (9), corroborating a role of L-selectin in IPC migration through HEV. Murine IPC can be cultured in vitro in relatively large numbers (13), providing the opportunity to further investigate the mechanisms of IPC homing. In this study, we show that murine IPC cultured from bone marrow (BM) express L-selectin, CXCR4, and CXCR3 and migrate poorly in vitro in response to CXCR3 ligands, like human IPC. Remarkably, we find that CXCL12 restores responsiveness of murine and human IPC to CXCR3 ligands in vitro and that CXCL12 is present in HEV in vivo. Following stimulation with viruses, CpG oligonucleotides, or cells expressing CD40 ligand (L), IPC secrete inflammatory chemokines, which may attract other IPC, promoting cluster formation in secondary lymphoid organs. Murine BM cells from 129 × 1/SvJ mice (The Jackson Laboratory, Bar Harbor, ME) were cultured in Flt3-L (10 ng/ml; R&D Systems, Minneapolis, MN) at 2–4 × 106 cells/ml for 7–9 days and were sorted into CD11c+/CD11blow and CD11c+/CD11bhigh subpopulations on a MoFlo cytometer (purity >95%; Cytomation, Fort Collins, CO). Human IPC were isolated and cultured as described previously (4, 7). Cells were stimulated with CpG oligonucleotide 2216 (3 μg/ml) (14), influenza virus PR8 (0.1–1 multiplicity of infection), and CD40L-transfected J558L cells (4). Anti-mouse (m) CXCR3 mAb 173 was generated by immunizing male Armenian hamsters with a peptide containing the amino-terminal 37 residues of mCXCR3. This peptide sequence is unique to mCXCR3. Anti-mCXCL9 mAb 2F.5.5.5 was generated by immunizing male Armenian hamsters with recombinant mCXCL9 (R&D Systems). Specificity of 2F.5.5.5 was confirmed by ELISA (data not shown). Anti-mCXCL10 1F11 was kindly provided by A. D. Luster (15). Anti-mCXCR3 was either conjugated with FITC or detected by biotinylated goat anti-hamster Ab (Jackson ImmunoResearch Laboratories, West Grove, PA) and streptavidin-allophycocyanin (Molecular Probes, Eugene, OR). Cells were counterstained with directly labeled rat anti-mouse CD11c, CD62L, CD11b, or CD86 (BD PharMingen, San Diego, CA). Goat anti-mCXCR4 antiserum (Santa Cruz Biotechnology, Santa Cruz, CA) was detected with biotinylated donkey anti-goat antiserum (Jackson ImmunoResearch) and streptavidin-allophycocyanin (Molecular Probes). Murine intracellular CCL3, CCL4, and CCL5 were detected as described elsewhere (16). Human intracellular chemokines were detected with directly labeled Abs (BD PharMingen and R&D Systems). mCXCL9 and mCXCL10 were measured in the supernatant by ELISA using monoclonal hamster anti-mCXCL9 (5 μg/ml) and anti-mCXCL10 (2.5 μg/ml), goat anti-mCXCL9 (1 μg/ml; R&D Systems), or anti-mCXCL10 (0.2 μg/ml; Santa Cruz Biotechnology), biotinylated anti-goat Ab (Vector Laboratories, Burlingame, CA), and avidin-HRP (Sigma-Aldrich, St. Louis, MO). Human CXCL10 and CCL3 were detected by ELISA using matched Ab pairs (BD PharMingen and R&D Systems). ABTS (Sigma-Aldrich) was used as substrate. Chemotaxis was measured in a 2-h transwell migration assay using 24-well Costar Transwell chambers (5-μm pore size; Corning, Cambridge, MA) as described previously (5). Recombinant mCXCL12, mCXCL10, mCXCL11, and human (h) CXCL11 (PeproTech, Rocky Hill, NJ) were added to the lower wells in chemotaxis medium (RPMI 1640/1% human serum albumin), and 1 × 105 cells were added to the Transwell insert. Migrated cells were counted by microscopy and flow cytometry. Where indicated, cells were pretreated with pertussis toxin (100 ng/ml; Sigma-Aldrich) for 1 h at 37°C. Immunohistochemical analysis of Formalin-fixed, paraffin-embedded lymph node sections was done as described elsewhere (17) using monoclonal anti-hCXCL12 Ab K15C (kindly provided by F. Arenzana-Seisdedos (18)). Murine BM cells cultured in vitro with Flt3-L were highly enriched in CD11c+cells that included CD11blow and CD11bhigh populations. CD11blow cells expressed high levels of B220, Ly6-G/C and secreted type I IFN upon incubation with influenza virus and CpG oligonucleotides (Ref. 13 and data not shown). Therefore, CD11blow cells correspond to IPC in phenotype and function. As shown in Fig. 1⇓A, CD11blow IPC expressed CXCR3 and L-selectin (CD62L). In addition, CXCR3+ IPC expressed CXCR4 (Fig. 1⇓B). CXCR3 was also present on primary IPC from mouse spleen (Fig. 1⇓C). Upon incubation in vitro with influenza virus or CpG oligonucleotides, IPC reduced the expression of both L-selectin and CXCR3 (Fig. 1⇓D). CXCR3 down-regulation on IPC occurred within 3 h after stimulation of Flt3-L BM cells with influenza virus and was paralleled by increased expression of the T cell costimulatory molecule CD86 (Fig. 1⇓E). In addition, IPC acquired responsiveness to CCL19 within 6 h of stimulation with influenza virus (Fig. 1⇓F), indicating up-regulation of CCR7 expression. CXCR3 expression was also lost after incubation of IPC with the CXCR3 ligands CXCL10 and CXCL11 within 30 min at 37°C (but not at 4°C), demonstrating the specificity of the anti-CXCR3 Ab staining (Fig. 1⇓G). Expression of L-selectin, CXCR3, and CXCR4 on murine BM-derived IPC. A, Expression of CXCR3 and CD62L on CD11blow IPC. Expression of CXCR3 and L-selectin on CD11bhigh DC was minimal. Gate is set on CD11c+ cells from Flt3-L-cultured murine BM cells. B, Expression of CXCR3 and CXCR4 on CD11c+/CD11blow IPC. C, Expression of CXCR3 on Ly-6G/C+ cells within CD11c+ DC purified from spleen. D, Down-regulation of CXCR3 and CD62L on gated CD11c+ cells from Flt3-L-cultured murine BM cells after incubation for 24 h with influenza virus. E, Kinetics of CXCR3 (▪, •) and CD86 (□, ○) expression in unstimulated (•, ○) or influenza virus-stimulated (▪, □) Flt3-L-cultured BM cells (gated on CD11c+/CD11blow IPC). F, Migratory response to CCL19 (▪) or control medium (□) of CD11blow IPC stimulated with influenza virus. G, Dose-dependent down-regulation of CXCR3 on Flt3L-cultured BM cells by treatment with CXCL11 and CXCL10 (30 min, 37°C). It has been previously shown that human IPC migrate poorly in vitro in response to CXCR3 ligands despite the expression of CXCR3 (4, 5). Similarly, murine BM-derived IPC showed a minimal migration in response to CXCL11 in chemotaxis assays (Fig. 2⇓A). In contrast, murine IPC responded to the CXCR4 ligand CXCL12 and, remarkably, became responsive to CXCL11 in the presence of CXCL12 (Fig. 2⇓A). The capacity of CXCL12 to induce IPC responsiveness to CXCR3 ligands was also confirmed in human IPC (Fig. 2⇓B). Migration of murine IPC to CXCL12 was dose dependent (Fig. 2⇓C). A minimal CXCL12 concentration of 25 ng/ml was required for detection of IPC migration to CXCL11 (Fig. 2⇓C). In the presence of CXCL12, chemotaxis to CXCL11 showed also dose dependency (Fig. 2⇓D). Pretreatment of IPC with pertussis toxin abrogated the migratory response to CXCL12 and CXCR3 ligands (Fig. 2⇓E), indicating that responsiveness to CXCR3 ligands induced by CXCL12 requires signaling through Gαi subunits of heterotrimeric G proteins. 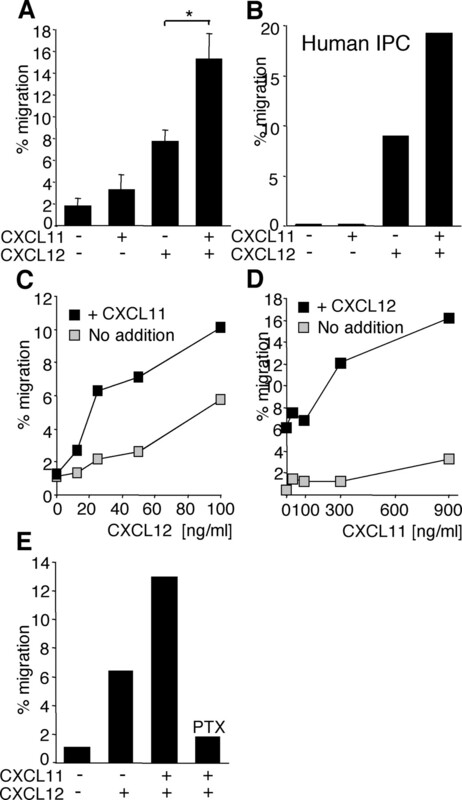 CXCL12 induces responsiveness of murine BM-derived IPC and human IPC to CXCR3 ligands. A, Chemotactic response to CXCL11 (300 ng/ml) and/or CXCL12 (100 ng/ml) of murine CD11blow IPC sorted from Flt3L-cultured BM cells. The percentage of migrated cells is shown (mean + SEM, n = 3). B, Chemotactic response of purified human IPC to human CXCL11 (300 ng/ml) and/or CXCL12 (100 ng/ml). C, Migration of CD11blow IPC in response to increasing concentrations of CXCL12 in the presence or absence of CXCL11 (300 ng/ml). D, Migration of CD11blow IPC in response to increasing concentrations of CXCL11 in the presence or absence of CXCL12 (100 ng/ml). E, Migration of CD11blow IPC in response to CXCL12 (100 ng/ml) alone or in combination with CXCL11 (300 ng/ml) with or without pretreatment with pertussin toxin (100 ng/ml). To understand whether the cooperation between CXCL12 and CXCR3 ligands observed in vitro has any physiological relevance in vivo for the migration of IPC to secondary lymphoid organs, we investigated which cells express CXCL12 in human lymph nodes and tonsils. As shown in Fig. 3⇓A, a CXCL12-specific mAb strongly stained the area surrounding germinal centers, which was previously shown to be a major source of CXCL12 in tonsils by in situ hybridization (19). In addition, the anti-CXCL12 Ab brightly stained HEV (Fig. 3⇓B), indicating that HEV produce CXCL12 or acquire it by transcytosis (20). Thus, CXCL12 on HEV may mediate constitutive migration of IPC into the lymph nodes. The simultaneous action of CXCL12 and CXCR3 ligands that are produced by HEV during inflammation (21) may boost IPC recruitment to inflamed lymph nodes. 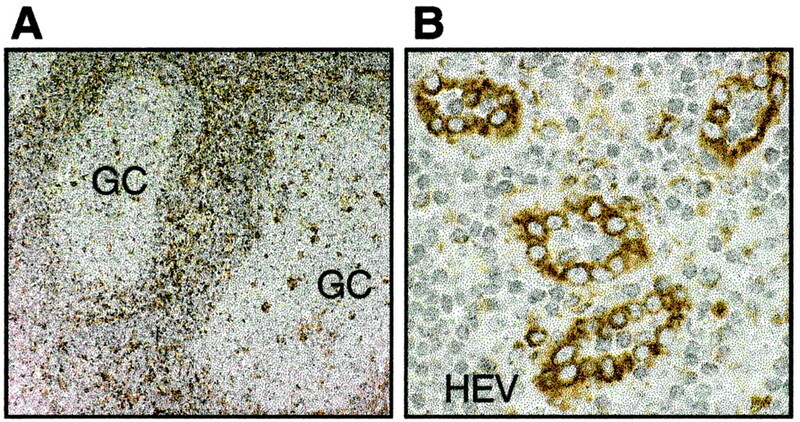 CXCL12 expression in human lymph node HEV. Paraffin sections of human lymph nodes were stained with anti-hCXCL12 (brown). GC, Germinal center. Since CXCR3 expression on IPC was rapidly lost upon viral stimulation (Fig. 1⇑, D and E), we asked whether this is an intrinsic feature of IPC activation or whether it is due to autocrine secretion of CXCR3 agonists which down-regulate the cognate receptor. As shown in Fig. 4⇓A, sorted CD11blow IPC secreted high levels of CXCL10 when activated with influenza virus or CpG oligonucleotides, whereas LPS had no effect. Stimulated IPC also produced the inflammatory chemokines CCL3, CCL4, and CCL5 (Fig. 4⇓B). CD11bhigh cells were also capable of producing inflammatory chemokines upon stimulation with LPS (data not shown). The capacity of IPC to produce high levels of CXCR3 ligands as well as other chemokines was confirmed in human cells. Activation of human IPC with influenza virus, CpG, and CD40L induced production of CXCL10 and CXCL9 as well as CCL3, CCL4, and CCL5 (Fig. 5⇓, A and B). 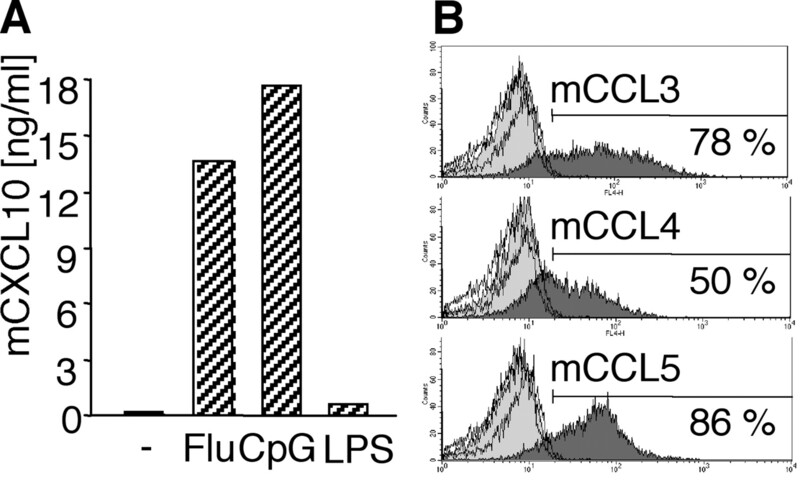 IPC chemokine production was comparable to that of monocyte-derived dendritic cells (Mo-DC) stimulated with LPS and/or CD40L (data not shown) with only two exceptions: CCL22 was preferentially produced by Mo-DC whereas CCL3 was mainly produced by IPC (Fig. 5⇓C). Thus, IPC and Mo-DC produce a similar spectrum of chemokines, although in response to distinct stimuli and, most likely, at different anatomical locations. Production of proinflammatory chemokines by murine BM-IPC. A, mCXCL10 was measured by ELISA in the supernatant of CD11blow IPC sorted from Flt3L-cultured BM cells and stimulated with medium, influenza virus, CpG, or LPS for 48 h. B, mCCL3, mCCL4, and mCCL5 production by CD11blow IPC was determined by intracellular staining after stimulation for 18 h with CpG. Production of proinflammatory chemokines by human IPC. A, hCXCL10 and hCCL3 were measured by ELISA in the supernatant of purified human IPC (1–5 × 105 cells/ml) stimulated with influenza virus, CpG, or CD40L-transfected cells for 48 h. B, Chemokine production by purified human IPC stimulated for 18 h with CpG, CD40L-transfected cells, CpG plus CD40L, and influenza virus was measured by intracellular staining. C, Production of CCL2, CCL3, CCL4, and CCL22 in Mo-DC stimulated for 18 h with LPS plus CD40L. We show that murine BM-derived IPC, like human blood IPC, express L-selectin, CXCR3, and CXCR4 and migrate in response to CXCL12. Most importantly, both murine and human IPC require CXCL12 to respond to CXCR3 ligands in vitro. We also show that CXCL12 protein is present in lymph node HEV in vivo. Thus, CXCL12 mediates constitutive migration of IPC and capacitates IPC to migrate in response to inflammatory chemokines. These results are consistent with the previous demonstration that IPC infiltrate tumors secreting CXCL12 in vivo and migrate to CXCR3 ligands in vitro through a monolayer of endothelial cells (6). CXCL12 has been previously detected in cultured HEV cells and shown to support lymphocyte transmigration in vitro (22). Furthermore, CXCL12 is strongly expressed in endothelial cells and perivascular cells of the skin (18) and in rheumatoid synovium (23). Since previous studies did not detect CXCL12 transcripts in HEV in situ (19), it remains to be determined whether HEV produce CXCL12 or take up CXCL12 by transcytosis, as previously reported for CCL19 (20) or CCL2 (24). The mechanism by which CXCL12 induces IPC responsiveness to CXCR3 ligands is yet unknown. CXCL12 does not up-regulate the expression of CXCR3 in IPC and does not dramatically increase the affinity of CXCR3 for its ligands (data not shown). CXCL12 may facilitate signaling events downstream of CXCR3 by recruiting, activating or disinhibiting signaling mediators (25). Upon activation, IPC up-regulate CCR7 and respond to its ligands. 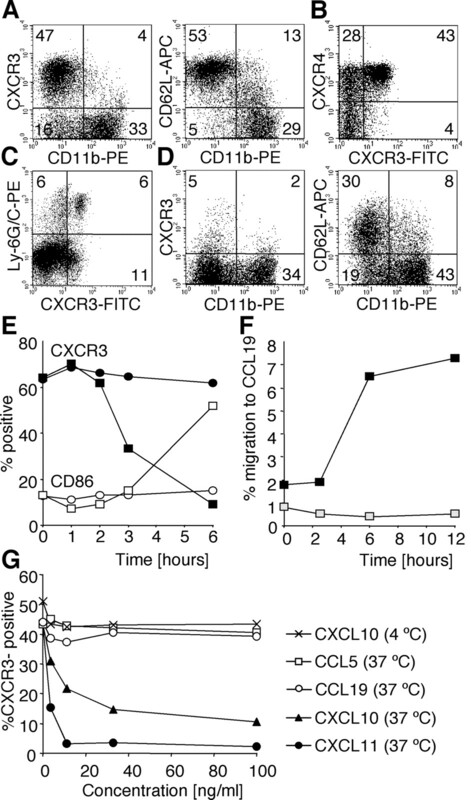 As myeloid dendritic cells (DC) produce CCL19 during maturation (26), up-regulation of CCR7 on IPC may allow IPC positioning close to maturing DC. IPC-mediated secretion of type I IFN may therefore protect DC from the cytopathic effect of viruses, maintaining DC Ag-presenting function (27). Finally, our study demonstrates that activated IPC secrete high amounts of CXCR3 ligands and other inflammatory chemokines. Chemokines produced by IPC in the lymphoid organs may attract more IPC from the blood, leading to their accumulation around HEV. Release of CCL3 and CCL5 in the lymph nodes may also be important in preventing HIV spread to proliferating CD4+ T cells and IPC themselves (28). Although the type of chemokines produced by IPC is very similar to that of myeloid DC, the nature of pathogens inducing chemokine secretion and the anatomical localization of chemokine release are likely to be different. Bona fide DC are activated by pathogens or danger signals in peripheral tissues, where they release a burst of inflammatory chemokines before migrating to secondary lymphoid organs (29). In contrast, IPC are rarely found in peripheral tissues, circulate in the blood, and can rapidly reach lymph nodes via HEV. Thus, IPC may be important for the early production of inflammatory chemokines in secondary lymphoid organs, contributing to attraction and retention of Th1-prone T cells (30). We thank William Eades (Siteman Cancer Center Sorting Core Facility, Washington University School of Medicine, St. Louis, MO) for expert cell sorting. ↵1 A.K. was supported by the Deutsche Forschungsgemeinschaft (KR 2199/1-1). R.I.U. and R.D.S. were supported by the National Cancer Institute (CA90403, CA76464). ↵3 Abbreviations used in this paper: IPC, natural IFN-producing cell; HEV, high endothelial venule; IP-10, IFN-γ-inducible protein 10; I-TAC, IFN-γ-inducible T cell α chemoattractant; MIP, macrophage-inflammatory protein; L, ligand; BM, bone marrow; Mo-DC, monocyte-derived dendritic cell; DC, dendritic cell; m, mouse; h, human. Dalod, M., T. P. Salazar-Mather, L. Malmgaard, C. Lewis, C. Asselin-Paturel, F. Briere, G. Trinchieri, and C. A. Biron. 2002. IFN-α/β and IL-12 responses to viral infections: pathways regulating dendritic cell cytokine expression in vivo. J. Exp. Med. 195.